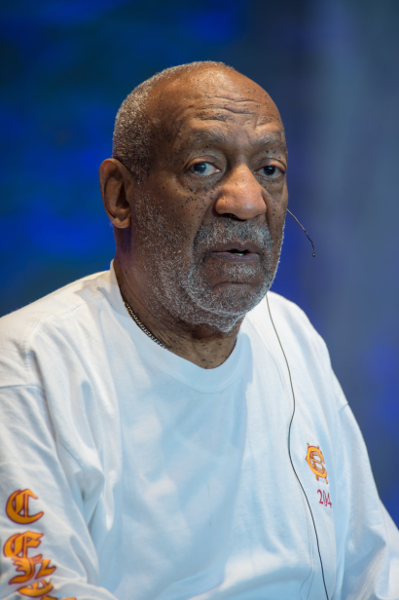 Disgraced comedian/actor Bill Cosby is speaking out from behind bars via his spokesman/self-proclaimed right-hand man Andrew Wyatt four months after he turned himself in to a maximum security Pennsylvania prison And he's making some bizarre statements. The "Cosby Show" co-creator is currently behind bars serving 3 to 10 years after he was found guilty of drugging and sexually assaulting Andrea Constand in 2004 after two trials. It's reported he recently settled a civil lawsuit with her for nearly $3.4 million. In a new interview with Philadelphia's NBC10, Wyatt shares a few details about how the 81-year-old entertainer - who's legally blind - is handling life behind bars. And despite being locked away from his wife, children and friends, he's seemingly having an "amazing experience." So he claims. Hmph. "Despite the circumstances, he said, ‘This is an amazing experience,'" Wyatt shares in an interview with NBC10. Oh, and there's much more. Wyatt says Cosby is in high spirits and he remains unapologetic about his situation because he feels he did nothing wrong, even if it leaves him to serve the 10-year maximum. “When I visit him, it’s nothing sad about it,” Wyatt says. “He’s not sad. He’s not remorseful because he did nothing wrong." Not only does he feel like he hasn't done anything wrong, Cosby considers himself a "political prisoner," comparing himself to political and social leaders like Martin Luther King Jr. and Nelson Mandela. Cosby's wife, Camille Cosby, nor his children have come to visit him at SCI Phoenix maximum prison. "Right now I'm his only visitor outside of his attorneys, and that's the way he wants it," Wyatt tells NBC10, noting that Cosby's wife Camille hasn't seen him in prison because "he does not want her to visit him." Cosby prefers to speak to his wife on the phone, three times a day for three minutes, the most he's allowed. Wyatt also shares Cosby's day-to-day routine, which includes waking up everyday at 3:30AM to workout before breakfast and rinsing off all of his food to reduce his sodium intake. Cosby doesn't have a cellmate, however, some inmates have been assigned to help Cosby navigate the facility, given his age and being legally blind. "He’s mentally strong. He's just a strong man," Wyatt says.